In the project’s pilot year (2014-15), the Thunder Bay District Health Unit and the Lakehead District School Board collaborated on the Youth Mental Health and Addiction Champion initiative. Two secondary schools participated in the pre-centralized, centralized and champion training sessions. Two teachers, five public health nurses and four students travelled more than 1,300 km from Thunder Bay to Caledon, Ont. (north of Brampton) for the centralized training. When they returned to Thunder Bay, the students and teachers quickly got to work recruiting student champions in their schools. Student leaders and public health nurses co-facilitated a full day of training for student champions from the two participating schools. Student YMHAC teams then met on an ongoing basis to plan and implement positive mental health initiatives in their schools. These initiatives included advocacy for a “chill room” at their respective schools, anti-stigma activities and stress busters prior to exams. Student champions advocated for a safe space in their school for students experiencing mental health struggles. They raised funds, designed the space and gave input into the policy and procedures for using the room. 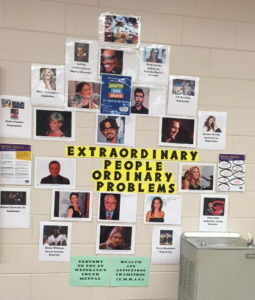 To combat the stigma surrounding mental health, students created a mural of celebrity photos of celebrities who live with a mental health challenge. They also hosted a Break the Stigma Egg Toss, during which students threw eggs at a target covered in stigmatizing words. Exam-time stress and coping skills were priorities that student champions identified at their schools. So, they hosted a variety of stress busters leading up to exams. One involved welcoming a local dog rescue group to the school for the day, and then inviting students to pet the dogs in the courtyard during their lunch break. Students also hosted a lunchtime screening of the movie Finding Nemo. At one school, students even hosted stress busters for Grade 8 students attending the open house event for the incoming Grade 9 cohort. It was a busy and rewarding first year of the initiative. Teams came alive again at the participating schools in the 2015-16 school year. Year two brought more stress busters around exams as well as a week of holding open doors, to promote a positive school climate. As the year progressed, the YMHAC initiative also grew. In April 2016, it expanded to the remaining secondary schools in the Lakehead DSB. Before the expansion, public health nurses and students collaborated to understand what had been learned from the pilot year. Once again, training took place over a full day for students from the three high schools new to the initiative. They learned about mental health literacy, stigma reduction and positive mental health promotion. Students have a variety of initiatives planned – and will be exciting to see their creativity continue to yield success.